An artist rendering of the football stadium in Carson, Calif., that would be shared by the Chargers and Raiders. IRVING, Tex. — N.F.L. owners continued to scramble for ways to accommodate the three teams interested in moving to Los Angeles. 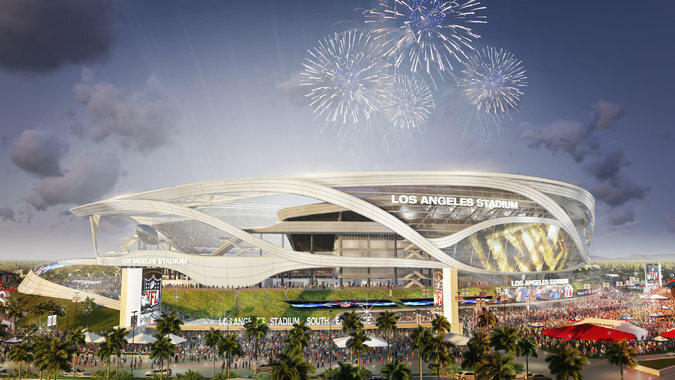 At a meeting here Wednesday, the owners were briefed on the progress the Oakland Raiders, the San Diego Chargers and the St. Louis Rams have made in their plans for moving to Los Angeles, if approved by the league. But aware that no more than two of them will be allowed to relocate, the owners are looking for solutions for all three. One option discussed at the meeting involved a letter sent last week from Stan Kroenke, the owner of the Rams, to the Committee on Los Angeles Opportunities. In the past, Kroenke said that he would welcome a second team in his building, but as a tenant, which is a less appealing option because it could limit the revenue a second team would make.